Distribution poles and wires are still the backbone of the U.S. energy delivery system, and as such are critical to the utility mission of providing electric power with sufficient capacity and reliability. When a pole goes down, wires break or hit the ground, and invariably power is interrupted or safety is compromised. Distribution poles are primarily supported by the length of pole in the ground and attached conductors, with guy wires providing counter-tension to balance poles against resultant forces. The strength of the guying assembly is determined by the holding capacity of the steel anchor buried in the soil. If the anchor fails, this could lead to failure of the pole structure with severe reliability and safety consequences. The National Electric Safety Code (NESC) places a legal burden on the utility to detect and mitigate any “deterioration during service” which might reduce the strength of the pole structure. Regardless of the specific anchor type or medium, over time a natural electromechanical process, called corrosion, is set in motion which can lead to loss of cross-section of the anchor rod (“deterioration during service”) and failure of the guy assembly. The two most common modes of anchor corrosion are uniform and galvanic corrosion. 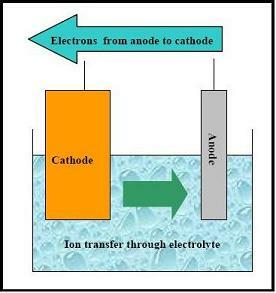 Commonly used techniques to prevent and mitigate corrosion range from passive measures such as design changes (forging the anchor eye directly into the rod), installation measures (using guy-strain insulators to isolate the anchor assembly from the rest of the system), and coatings (tar-bitumen, asphalt or zinc galvanization), to active measures such as cathodic protection with sacrificial anodes and impressed current systems. 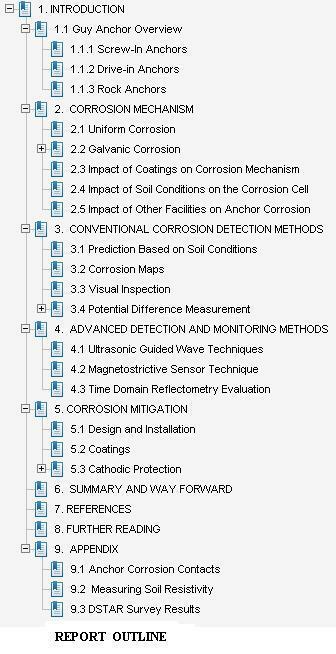 This 43 page report issued by DSTAR is a comprehensive study that describes: various types of guy anchors and modes of anchor corrosion; investigates established and new technologies for corrosion prediction and detection; and discusses commonly used techniques for preventing and mitigating anchor corrosion.